Do you or a loved one suffer from asthma or other respiratory illnesses? If so, you know just how valuable good air quality is. You may be shocked to learn that an overlooked part of your home could be affecting your air quality and contributing to asthma symptoms. Asthma is a chronic inflammatory disease of the airways. While the cause of asthma is thought to be genetic, many triggers are environmental. We can’t do much about our genes, but we can have some control over our environment. Asthma can be aggravated by allergens. Common allergens found in homes include dust mites, pet dander, pollens and molds. Most people with breathing issues realize that these allergens can get trapped in carpet fibres and so they install laminate, wood or tile flooring. But can you guess where else these allergens love to lurk? That’s right: popcorn ceilings! The nooks and crannies in popcorn ceilings provide the perfect place for allergens to hide and fall back down into the air we breathe. Since popcorn ceilings can’t be cleaned or vacuumed, the best thing is to have them removed. Popcorn ceiling removal is possible, but should only be done by experienced ceiling professionals. As with any renovation project, there will be some dust involved, so if anyone in your family has asthma or is sensitive to dust, it may be a good idea to stay elsewhere while the ceilings are being worked on. Depending on the size of the home, this could be from 3 – 7 days. Once done, the ceilings will be smooth and you’ll no longer have to worry about hidden allergens. As a bonus, the ceilings will look modern and bright. 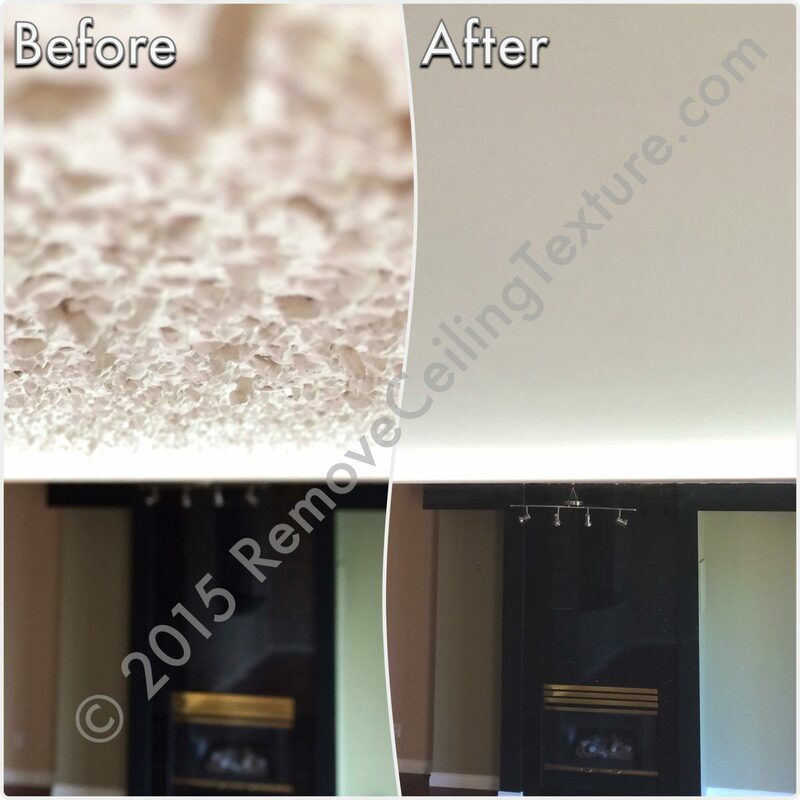 As our name implies, at RemoveCeilingTexture.com, we specialize in removing ceiling texture. This is what we do day in and day out, so we are experts in our field. If you have popcorn ceilings and asthma, or you just want to get rid of the texture for aesthetic reasons, we can help. To learn more about our removal process, read our Ceiling Refinishing article. For more Before and After photos, visit our Flickr page! If you would like more information about having your popcorn ceilings removed, please contact us by phone at 604-420-7578, or send us an email. To find out more about popcorn ceiling removal, or to get a FREE quote, contact us today!